When using a Samsung S7,S8,etc. that you need to do something special to the Wifi module- You need to press the RESET button 4 times quickly to enable the "Samsung Mode" - the SSID then changes to WIFIAV - SAMSUNG. 1. Warm tips: Because app version had not updated, Wifi transmitter not support Galaxy J7 S7 S8+. 2.The free "WiFiAV" app, download and install from the Google Play Store or app store. Please confirm your download app is correct. 3. When trying to using wifi transmitter, please turn off local data or wifi. Connect cellphone to"wifiav", device name (WiFiAV), default password (12345678) it can be customized to a new name and password of so desired. 4.The rear camera installed onto rear of license plate area, resolution is 640 * 480, cleaning the camera lens before installed. Wifi Signal range is 20-60ft working good. 5. 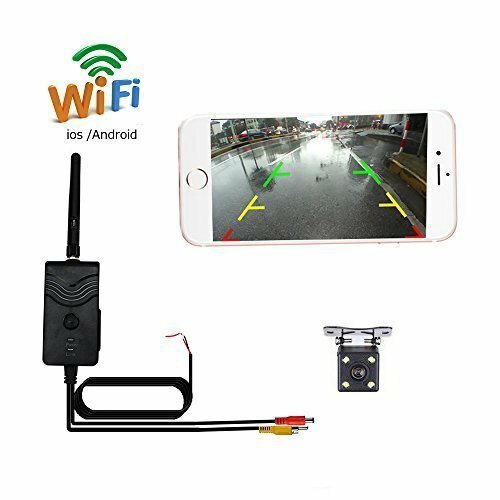 When driving on road, the rear camera and transmitter will affected by driving enviornment, the signal maybe delay 2-5 sec, It is due to the device itself taking some seconds to automatically scan and connect to the WiFiAV transmitter which is saved in the device's WiFi access points list. it is a normal phenomenon. 6. If you could not connected, please check if open local data or other wifi connected to your device. If not, there is a button on the transmitter, reset it and it will turn on blue light. Before installed onto vehicle, please test again. Backup Camera & Wifi Transmitter Feature: Rainproof, dustproof and shockproof; support minimum illumination less than 0.5 Lux digital signal, you could get a clear image even at night. Easy to install and operate: Connect wifi transmitter and rear camera to backup light or 9V-30V power, download "WIFIAV" app in your phone (smart device) and get a image signal.